Editor’s note: The following is a guest post from Yoni Stadlin, founding director of Eden Village Camp. Many of you celebrated at this summer’s Bereishit Festival or you may have just heard of them through the grapevine. As we look toward our next Jewish holiday of Tu Bishvat, we invite you to hear Stadlin’s inspiring story. Oh yeah, and thanks to three huge Jewish organizations for investing millions in such an awesome project! 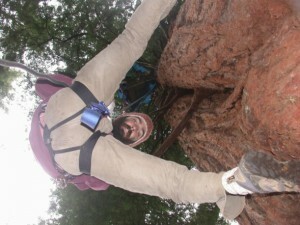 My name is Yoni Stadlin, and I am a redwood-tree-sitter. Redwoods are the tallest trees in the world, can grow up to 300 feet tall, and can live for two thousand years! 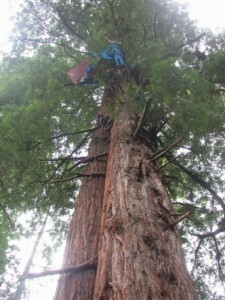 I lived aloft in redwood trees for two months of my life. Tree-sitters are people who live up in trees that are slated to be cut down, on the wager that no one would cut down a tree with a person in it. Tree-sitting has been effective in protecting huge groves and helping change many policies, but many of these ancient beauties have been logged nonetheless. Ninety-five percent of coastal redwoods in the northwest U.S. have been logged for making things like decks, playgrounds and tools. The practice of clear-cutting – leaving no trees standing – has turned huge, lush, vibrant and ancient redwood forests into eroded wastelands, destroying habitats, contaminating water, and massively increasing our species’ footprint on this planet. Imagine, people in trees! One person, name Julia Butterfly, lived aloft for two and a half years on a suspended platform in a tree named Luna. Imagine where you were two and a half years ago, and imagine being held by a gigantic tree from then until now. Imagine seeing no doors, not one building, road or florescent light, and your feet never touching the ground. This is what I did for two months, and I loved it. In our tree named “Libertal,” we lived on creations we called dream-catchers, which are big hammocks connecting to branches along the perimeter, like a spider web, and enclosed in a tarp. The dream-catcher had piles of sleeping bags and blankets on it, and from nearby branches we hung industrial five-gallon buckets of food that were often donated from farmers’ market leftovers. From one branch, a counter-top hung with a small camping stove built into it for cooking. We went to the bathroom in industrial buckets with tight lids that hung fifteen feet from the platform, and ascended and descended Libertal using harnesses and ropes that hung from the tree’s top. There was a lot of reading, talking, music-making, cooking, building and fixing, and lots of watching the birds, trees and sunsets do their dance. Tree-sitters often create neighborhoods by connected zip-lines between trees and tree-sitters. I have been in tree villages with eight other people at once, and at other times have been the only human for miles. Volunteers from the community, called “ground support,” would carry supplies to us once or twice a week, usually in the very middle of the night after their work or school. I’d wake up and, using a pulley system I’d constructed, haul up food, water, books, warm layers, rope, and whatever else we’d asked for. I would celebrate Shabbat by lighting candles, blessing wine or grape juice, eating my best food, and singing myself to sleep. During Chanukah, eight people gathered in one tree and lit candles, sang songs and celebrated. There wasn’t enough room in the dream-catcher so I locked my rappel device and hung suspended from a rope for the whole party! Up in the trees, there are is an exciting yet limited number of activities to do, but as always, limitless things to think and talk about. I would often wonder what brought me to do something so radical and found that my Judaism was a major factor. For example, on Tu B’shvat, we celebrate the birthday of the trees and often share the story of Honi the circle-maker, who questioned why an old man he encountered was planting a carob tree, even though carob trees take decades to make fruit: the old man explained he was planting for the sake of future generations. 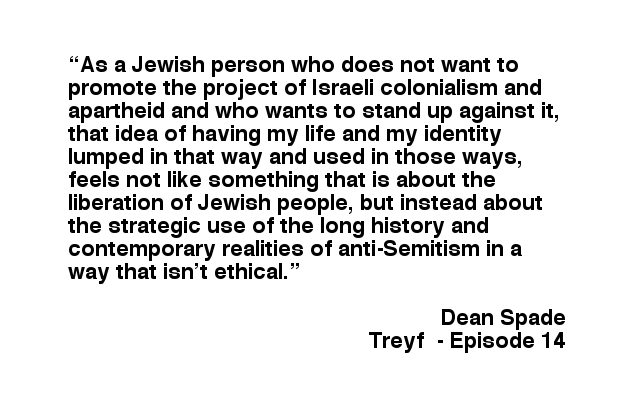 From this and countless other Jewish inspirations, I learned to plan ahead for future generations, cherish our trees, respect our elders, and go out on a limb for what I value and believe in. Our creation story tells us that humans were placed in a precious garden and given the blessing and responsibility of caretaking the garden. I believe that the garden still exists, and becomes manifest when we recognize nature as a blessing and take responsibility for promoting its health. The big new “tree” in which I have been sitting has been the creation of a brand new Jewish environmental overnight summer camp. With the generous support of a $1.1 million grant from the Foundation for Jewish Camp and Jim Joseph Foundation, Eden Village Camp has become a reality and we are open for campers this summer! Our goal is to inspire generations of Jewishly motivated world-fixers who feel empowered to act on their beliefs. We are located on 248 acres with a glorious lake, one hour north of New York City, surrounded by state park and touching the Appalachian Trail. The UJA Federation of New York is providing us with this incredible site and a 1.6 million dollar renovation is currently under way. Explore www.EdenVillageCamp.org for many more details and please help spread the word. What would you go out on a limb for? What is your tree? What do you sit for? I’m adding tree-sitting to my list of things I’d like to do one day. I’m not, but thank you for sharing Yoni. If you write anything more about your experiences as a tree-dweller, please forward it for publication here! I really enjoy the survivalist aspect of your experience.